Posted July 28, 2015 by eventreb & filed under Event Networking, Event Rebels Blog, Resources Lead Retrieval. Meeting Professionals International’s World Education Congress 2015 begins in a few short days. What have you done to begin networking? 2. Download the Conference App – Conference apps typically have a list of all attendees now. You can connect and message them within the app. This is another good opportunity to search for those attendees you may want to connect with. Send them a quick message introducing yourself and make a plan to meet at one of the parties or receptions. Wait? You haven’t signed up for the parties yet? 3. Register for the Receptions and Parties – Alright Alex, how do I find out about all these parties and receptions? The first place you should look is the conference’s website. Events like Rendezvous and The Big Deal cost extra, but if your main goal of the conference is to network, it’s worth the extra money. These do require a ticket. Events like the opening and closing reception are free and don’t require additional registration. If you’re looking for special parties hosted by sponsors, check out the conference social media feeds and search for the conference hashtag (In this case #WEC15). My nights quickly filled up after that. 4. Follow the Influencers – While you’re on twitter you may notice the same people tweeting about the upcoming conference over and over again. These can be considered social media influencers and you can expect that the tweets wont slow down once the conference begins. Follow them! They’ll be tweeting about all the cool stuff going on at the conference. Take a minute to send them a direct message introducing yourself and then get excited about meeting in person! 5. Become an Influencer – If you’ve done the previous 4 tasks, you’re probably way ahead of most attendees. You know all the cool parties to go to, how to use the app, and who to follow on social media. It’s time you share that information with other attendees. Take to social media and become an influencer yourself. You’ll be surprised how many people start reaching out to you and introducing themselves. And you don’t even need to create the content yourself. Retweeting can be just as effective. 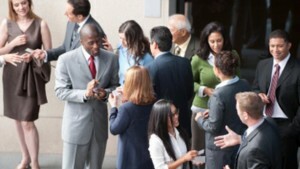 These 5 simple tasks can prepare you for a conference full of networking!